We can relatively easily isolate “super” oligotrophs from various environments, which can grow on minimal medium without additional carbon and energy sources. 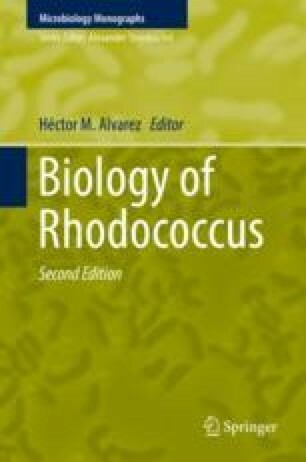 The super oligotrophs isolated to date have all belonged to the genera Rhodococcus and Streptomyces. This chapter primarily describes the genetics and biochemistry of one of the super oligotrophs, R. erythropolis N9T-4, which was isolated from crude oil. It is suggested that C2 metabolism starting from acetaldehyde is the key to oligotrophic carbon metabolism of N9T-4. Intriguingly, this bacterium is also oligotrophic for nitrogen and sulfur sources. The most unequivocal evidence for the oligotrophy of N9T-4 relates to the utilization of nitrogen, in which ammonium transporter is involved in the incorporation of atmospheric ammonia under oligotrophic conditions. A unique intracellular structure found in the oligotrophically grown super oligotroph is also introduced.